Embellish the feeling of Raksha Bandhan by ordering online this Classy Silver Plated Thali with Sweets and Dry Fruits which also comes with a free Rakhi, Roli Tilak and Chawal. This Hamper comes with 500 gm. mixed Dry Fruits followed by 100 gm. Soan Papdi. Different pattern of Rakhis may appear. Silver Plated Rakhi Thali (Thali Size 5 to 6 inch) with 100 Gms. (Gross Weight) Soan Papdi, 500 Gms. (Gross Weight) Mixed Dry Fruits Box and 2 Rakhi, Roli Tilak and Chawal. Silver Plated Rakhi Thali (Thali Size 5 to 6 inch) with 200 Gms. (Gross Weight) Soan Papdi, 500 Gms. (Gross Weight) Mixed Dry Fruits Box and 1 Free Rakhi, Roli Tilak and Chawal. Silver Plated Rakhi Thali (Thali Size 5 to 6 inch) with 100 Gms. (Gross Weight) Soan Papdi, 500 Gms. 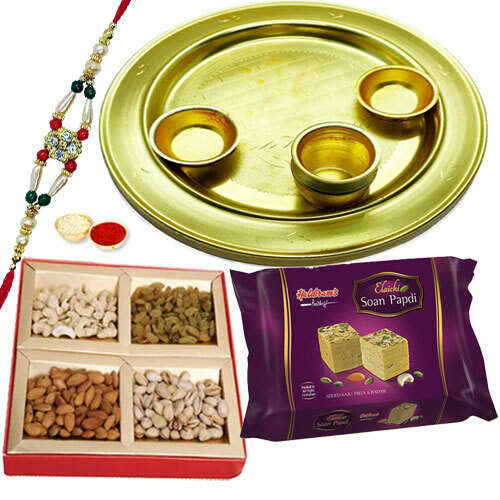 (Gross Weight) Mixed Dry Fruits Box and 1 Free Rakhi, Roli Tilak and Chawal. Silver Plated Rakhi Thali (Thali Size 5 to 6 inch) with 200 Gms. (Gross Weight) Soan Papdi, 500 Gms. (Gross Weight) Mixed Dry Fruits Box and 2 Rakhi, Roli Tilak and Chawal. Silver Plated Rakhi Thali (Thali Size 5 to 6 inch) with 100 Gms. (Gross Weight) Soan Papdi, 500 Gms. (Gross Weight) Mixed Dry Fruits Box and 4 Rakhi, Roli Tilak and Chawal. Silver Plated Rakhi Thali (Thali Size 5 to 6 inch) with 200 Gms. (Gross Weight) Soan Papdi, 500 Gms. (Gross Weight) Mixed Dry Fruits Box and 4 Rakhi, Roli Tilak and Chawal. Silver Plated Rakhi Thali (Thali Size 5 to 6 inch) with 400 Gms. (Gross Weight) Soan Papdi, 500 Gms. (Gross Weight) Mixed Dry Fruits Box and 1 Free Rakhi, Roli Tilak and Chawal. Silver Plated Rakhi Thali (Thali Size 5 to 6 inch) with 400 Gms. (Gross Weight) Soan Papdi, 500 Gms. (Gross Weight) Mixed Dry Fruits Box and 2 Rakhi, Roli Tilak and Chawal. Silver Plated Rakhi Thali (Thali Size 5 to 6 inch) with 400 Gms. (Gross Weight) Soan Papdi, 500 Gms. (Gross Weight) Mixed Dry Fruits Box and 4 Rakhi, Roli Tilak and Chawal.